CO2 has been a hot topic for a number of years mainly in relation to climate change and government policy. Leaving all of that aside, monitoring and controlling indoor levels of CO2 is important for everyone to consider for health, safety and even energy efficiency. CO2 is a known indoor pollutant affecting performance in the workplace, at school, and even at the gym. Extreme levels of CO2 can lead to death, particularly in enclosed spaces such as laboratories, some hospital rooms, and breweries. CO2 can have a number of effects on home and workplace health and safety. 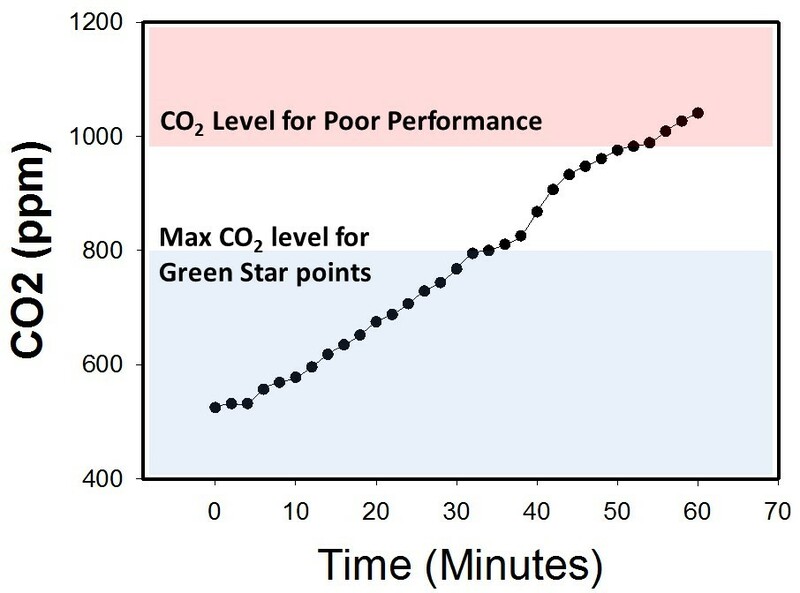 Controlling CO2 can also improve building energy efficiency, saving costs by up to 80%, and is even considered in the scoring of Green Star Ratings in building design. Here, we outline reasons why you should be measuring carbon dioxide levels inside buildings. Outside air has a CO2 concentration around 400ppm and each human breath contains around 30,000ppm. CO2 concentrations greater than 20,000ppm cause panting; above 100,000ppm (10%) CO2 can cause tremors and loss of consciousness; and values above 250,000ppm (25%) can lead to death. CO2 can be hazardous in one of two ways: by displacing oxygen in the blood or acting as a toxin. In the office and classroom, elevated levels of CO2, in the range between 1,000ppm and 2,500ppm, have been found to decrease information utilisation, increase headaches, decrease performance, and increase rates of absenteeism. Generally, CO2 concentrations at 1,000ppm can lead to a statistically significant decrement in decision making performance. CO2 concentrations at 2,500ppm, on the other hand, lead to large and highly significant decrements in decision making performance. Although CO2 is not the only factor, elevated levels can lead to that feeling of lethargy and tiredness often associated with office workers. Studies have shown that performance, associated with lethargy induced by elevated CO2, can decrease by up to 10% for adults and over 20% for schoolchildren. Figure 1 shows how rapidly levels of CO2 can increase in a poorly ventilated office. For example, in a 3.5-by-4-metre sized office with a single occupant, CO2 increased from 500 ppm to over 1,000 ppm within 45 minutes of ventilation cessation. Figure 1. An example of increasing CO2 concentration in a poorly ventilated office with a single occupant. Generally, where large numbers of people gather then CO2 will increase rapidly and lead to poor indoor air quality and pollution. In offices, this could be meeting rooms where a number of staff gather for extended periods in confined spaces. Other places, such as gyms, shopping centres, cafes with soft drink vending machines, or libraries, are increasingly being recognised as indoor environments with elevated CO2 leading to poorer performance. There are certain locations where indoor CO2 in an enclosed room or area can potentially reach extreme and life threatening levels. Any enclosed or poorly ventilated location where CO2 cylinders are stored or used will potentially have harmful levels of atmospheric CO2. Examples of such locations include laboratories and hospitals. Other spaces where CO2 is regularly used in the manufacturing or work process are also potential areas of harmful levels of CO2. Breweries are potentially extremely hazardous. Pockets of high CO2 can form in tanks and cellars and can quickly lead to death. Even bars, clubs and pubs, where CO2 cylinders are stored in a room, are increasingly required to monitor CO2 levels for workplace safety. Using CO2 sensors for ventilation control can assist in these cases. However, other systems with audible and visual alarms, such as the can be installed (Figure 2) warning workers and occupants of dangerous levels of CO2. The sensor is installed in the space with the CO2 source and an alarm indicator is placed outside. Measure indoor levels of CO2 is new to most people. In fact, most people would not have a clue what the CO2 levels in their room are, what they should be, and how they change throughout the day with various factors. Monitoring CO2 levels with a data logger is interesting, or having a wall-mounted or desktop LCD read-out, showing real-time CO2 levels, is also interesting. Informing your guests that you are controlling the ventilation in your building with a CO2 detector will certainly raise a few eyebrows! In conclusion, a work or learning place designed for optimal productivity leads to better performance and, ultimately, is better for the bottom line. Monitoring and controlling CO2 levels is one approach to a healthier workplace environment by using cutting edge MSR Germany CO2 sensor range detectors. Next Next post: Joventa Actuator – Motorized operation of air dampers in air conditioning systems.